Rabbi Moshe Sabag estimates that 14 or 15 thousand French Jews will immigrate to Israel as a result of recent terror attacks. The Rabbi of the Great Synagogue of Paris, Rabbi Moshe Sabag, predicted Sunday morning that the recent spate of terrorist attacks in France will prompt an even greater wave of French Jewish immigration to Israel. In an interview with IDF Radio, Sabag discussed the worsening situation and the frustration French Jews are feeling over their lack of security. "There is a very strong feeling that we need to leave," he said, "that these events are only growing and becoming worse. There is a sense that we need to leave - to the land of Israel or somewhere else. Every Jew feels a connection to Israel." In Rabbi Sabag's estimation "14,000 or 15,000 immigrants will come to Israel this year as a result of what has happened. There is a sense of insecurity and that these events are just getting worse." Aliyah from France is already on the rise as a result of an increase in anti-Semitic violence. 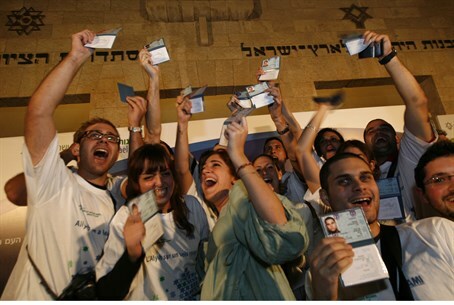 In 2014, France led the list of countries from which Jews made aliyah to Israel, with almost 7,000 new French immigrants, more than double the 3,400 who came last year. Like Sabag, many government officials and Knesset members have been predicting an even larger wave of immigration after the tragic events of the last few days, and have called on Israel to be prepared for unprecedented numbers. Minister of Aliyah and Immigrant Absorption Sofa Landver (Yisrael Beytenu) already predicted that more than 10,000 Jews from France would immigrate to Israel in 2015. MK Yoni Chetboun (Yachad - Ha'am Itanu), whose family hail from France, called on the government to make urgent preparations for an emergency mass-aliyah of French Jews - something he said the country was not currently prepared for. "Israel is not ready right now to absorb masses of Jews from France," said Chetboun, who chairs the Knesset Caucus for Olim from France. "Due to the impossible security situation [for French Jews], Israel has a responsibility to allocate all necessary resources to facilitate the aliyah and absorption of Jews from France." Other MKs, including, Religious Affairs Minister Rabbi Eli Ben-Dahan and fellow Jewish Home MK Moti Yogev, pleaded with French Jews to leave for Israel. On Friday, MK Yoel Razvozov (Yesh Atid), head of the Knesset’s Immigration, Absorption and Diaspora Affairs Committee, said he would convene an emergency session of the committee in the wake of the attack on a kosher supermarket in Paris. Razvozov said that Israel must be prepared to absorb Jews who come from France or anywhere else in the world as a result of ongoing terrorism. “The Jews of the world must know, especially on such a difficult day, that Israel is ready at any time to be their home and shelter. In the meeting I will chair on the subject I will make sure that the Israeli government is prepared to absorb the Jews of France, in a manner which ensures their personal safety,” said Razvozov. Prime Minister Binyamin Netanyahu also announced Saturday his plans to convene a special ministerial team to discuss ways to encourage immigration of French and other European Jews. In a televised statement, Netanyahu said: "To all the Jews of France, all the Jews of Europe, I would like to say that Israel is not just the place in whose direction you pray, the state of Israel is your home." "Every Jew who wants to come here will be received with open arms. We will help you absorb into our country," he said.